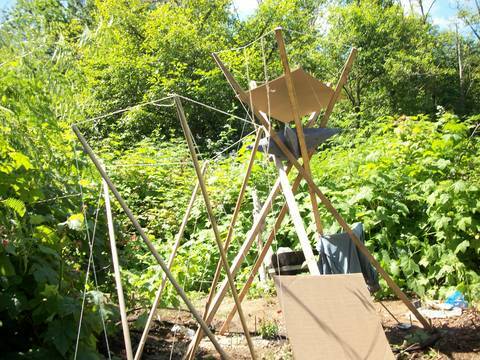 A 3 strut tensegrity shade structure was created by a group of students from different architectural schools in Europe, during the "FileToFactory" Workshop in Barcelona, May, 2009. They posted a time lapse video of their welding and assembly that includes a slide show of the structure deployed on a beach. By Sahar Darvishani, Giacomo Destefanis, Agata Guzik, Giorgos Kokolakis, Spyros Margetis, Jean-Emmanuel Marie, Stephan Pircher, Thibault Romany, Harikishnan Sashidharan, Marilena Skavara. Video created by Agata Guzik and edited by Marilena Skavara. Armin R. Kachel posted to Synergeo July 22, 2010 a 3 strut classic prism tensegrity, made of 8' 2"x2" with 3 string side tendons and 2 2mm polyester side tendons, with a cardboard square inserted to cast shade. 3 strut shade structure by Armin R. Kachel"